I've been meaning to write this post for quite some time. It references Christmas and gift giving, a wonderful time for sure, but I dunno if anyone really wants to hear about it in February. Although I'm going to do it anyways, certain things need to be said and I feel the need to say them :). One of the gifts I received for Christmas was something I would never ask for, ever thought to ask for nor was it like any other gift I have previously received. It was Christmas Eve and my brother's girlfriend handed me her gift. I reached into the bag and along with a sweet Batman vinyl figure what should I find? A jar. A jar that made me squeal with girlish glee (but, you know, in a manly way). I had in my hands a jar of peanut butter, a great gift in its own right, but this was not any jar of peanut butter. No sir. This was a jar of Peanut Butter & Co's White Chocolate Peanut Butter! How could something so wonderful exist? How have I never had this before? I was of course aware of Peanut Butter & Co, but not living in New York or having easy access to their products I guess I never paid much attention (for shame). I may have mentioned this before, but white chocolate is one of those things that I seem to forget I enjoy until I eat it. This is then followed with an “oh yeah” moment as I wonder how I ever forgot. But as excited as I was to try the peanut butter, I was also a little nervous. It reminded me of Nutella, and I don't really like Nutella. It's just too sweet and seems better suited to a cupcake then toast or any other breakfast food. I feared that the white chocolate peanut butter would be similar. Thankfully this was not the case and I enjoyed the flavour quite a bit. True, it's a little sweeter than “regular” peanut butter but it doesn't seem as rich. If you give it a second you can pick out the flavours of peanut butter and white chocolate individually. However, it doesn't taste like two ingredients arbitrarily smashed together. Instead it tastes like something entirely new. To be fair, I did try it on toast and I wasn't a huge fan. I'm not exactly sure why. I don't know if white chocolate sweet is the right kind of sweet for toast. But I didn't let this phase me. There are many ways to enjoy peanut butter. The label even suggested a few: “Try it with pears” and “Great for Baking” were prominently displayed on the jar. Although I am sure that it is wonderful with pears and terrific for baking, I wouldn't know. I want to say that I tried it with other fruits and in other unique ways, but alas, I cannot. 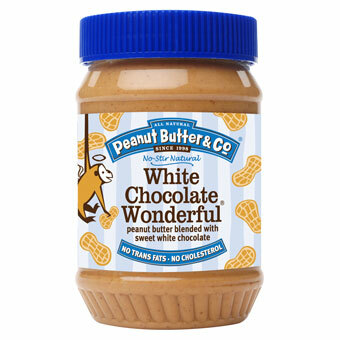 It is possible, perhaps even plausible, that I may or may not have potentially eaten the entire jar of white chocolate peanut butter with a spoon. And you know what? .... I wouldn't have had it any other way :). Need I say more :)?